On Tuesday evening I was so honored to see a full room of people – from high school students to senior citizens – at Suwanee City Hall to take part in my Gwinnett County Town Hall Meeting. We've had many occasions to meet together to discuss those issues that are important to us in the 7th District, and Tuesday was no exception. I heard people's concerns about the economy, about federal spending, about the appropriate use of taxpayer dollars, and about how Congress can and should do better for America. I take those concerns seriously, and I will certainly work to bring our 7th District values to Washington, D.C.
Last week I had the great opportunity to visit with my friends at Suniva in Norcross. Suniva is America’s leading manufacturer of high-efficiency, photovoltaic solar cells, and it was born and bred right here in our backyard at Georgia Tech. Unlike other high-efficiency solar cell companies that use expensive products and manufacturing techniques, the engineers at Suniva have figured out how to manufacture low-cost solar cells that are cost-competitive with conventional sources of electricity. Thanks to the talent and expertise of the Suniva team, this great company is flourishing. 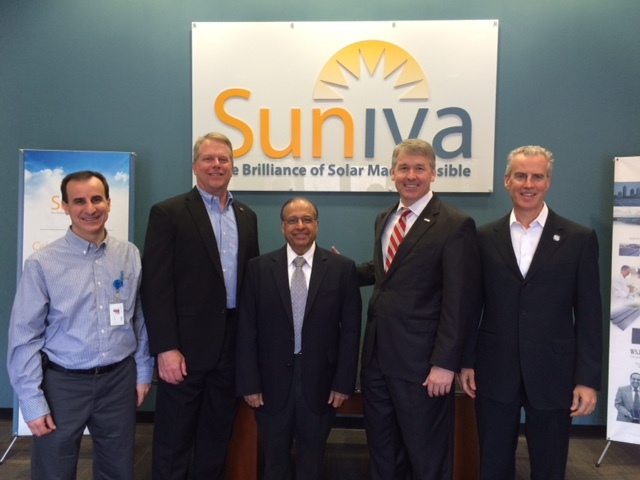 I was proud to work with this team to extend the Solar Investment Tax Credit (ITC) in last year's Omnibus Appropriations bill that was instrumental in supporting 400 jobs at Suniva. I have talked a lot about supporting an "all of the above" energy strategy to lower consumer prices, create sustainable energy alternatives, bolster both traditional and renewable sources of energy, and support good-paying American jobs. The ITC is one part of that strategy. Working together, Suniva has become a competitive force around the world, and one that I am proud Georgians are supporting. Too often I hear from folks who are concerned about a federal issue, but who unfortunately don’t believe that they have any ability to change the law. The good news is that is simply not true. You probably remember my telling you that we changed federal transportation regulations last year to help veterans get good paying jobs in the trucking industry soon after I met with a constituent who showed me there was a problem. That’s how the best laws are made – when the people come together to ask for change. I met with a number of local community leaders last week who are working every day to solve real problems in the 7th District and who need small changes in Washington to support their efforts. I want to highlight one of these groups for you. 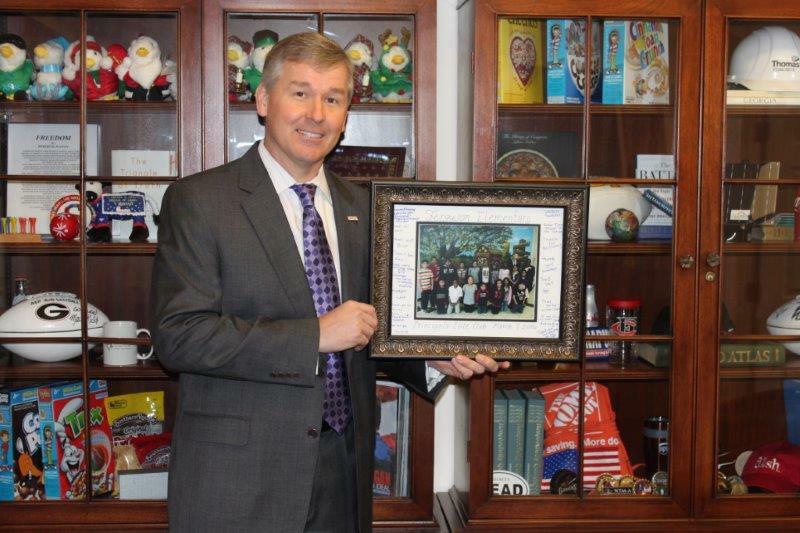 The folks from Family Promise of Gwinnett County work with faith communities and businesses in our area to provide housing for families who are struggling to make ends meet and who need a temporary support system to help them regain their family’s independence. Over the past few years we’ve all heard about far too many hard-working moms and dads who have lost a job or had a devastating medical condition that has made paying the mortgage or the rent impossible and has left them without a home. And that’s where Family Promise steps in. Far from relying on Washington for hand-outs, the generous people at Family Promise are asking for the federal government to do a better job jump-starting economic growth and ensuring that taxpayer dollars are going to help those who are most in need. The government should support entities like this that are laser focused on bringing the community together to help one another, and I commit to working with my colleagues in Washington to ensure that we are supporting great organizations like Family Promise. It’s always great to start my day at a local elementary school, and last Monday morning I had the privilege of speaking with a group of students in the Principal’s Elite Club at Ferguson Elementary School in Duluth. Students in the Principal’s Elite Club must be nominated by their teachers to participate in the program, which involves the completion of a number of service-oriented projects at school and in our community. I genuinely enjoyed spending time with this talented group of young people who have taken an early interest in serving others, and it gives me great hope that young people in our community are already engaged in the issues facing our nation, as they are far more likely to be impacted by the decisions being made right now in Washington than folks my age and older. I want to say thank you again to the students, faculty, and administrators at Ferguson Elementary School for the great start to my district work week. The good news is that Americans are united across party lines to fight this evil. The Republican and Democrat leaders of the Senate Foreign Relations Committee have already agreed to work together to draft a brand new package of economic sanctions on Iran. House Speaker Paul Ryan and House Foreign Affairs Committee Chairman Ed Royce have both condemned the missile test and called for increased sanctions. And even former Secretary of State Hillary Clinton has supported renewed and more robust sanctions as a response to this illegal test. The United States has a responsibility to lead the world in condemning Iran’s threatening and aggressive act, and I hope that the bipartisan support in Congress for holding Iran accountable will convince President Obama to finally do so as well. This week the House is expected to consider H.R. 4596, which makes it easier for small companies to provide broadband access to Americans across the country, and H.R. 3797, which supports the development of coal-reuse facilities that recycle coal ash into useful electricity for American consumers. The Rules Committee, which I’m proud to be a member of, is marking-up a very important resolution that will give Speaker Paul Ryan the authority to file an amicus brief on behalf of the House of Representatives in the case of U.S. v. Texas, which challenges President Obama’s unilateral immigration action, the Deferred Action for Parents and Lawful Permanent Residents (DAPA) program.